Awhile ago I posted about planting my vegetable garden in Transcendental Vegitation. I cleared the weeds, tilled the ground, planted the veggies and watered and fertilized them. Now you can see some fruits of that labor. 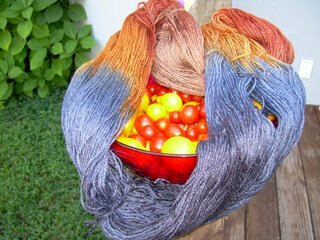 This bowl of tomatoes represents a mere fraction of my harvest but I had to show it off along with my wonderful new Schaefer yarn called Marjaana . Wouldn't it be totally cool if I could plant a yarn bush? I guess that is sort of what a sheep, llama or alpaca is but they are a lot harder to care for than a tomatoes! I bought it in a color called Toni Morrison. Apparently all their Marjaana yarn is named after famous women. Pretty neat actually. Also, just to make sure I was not alone, I talked my friend Bonnie in to buying a skein as well. We have now decided to both make the faux cable scarf from the recent scarf insert in the Fall 2006 Interweave Knits magazine. I now realize that this is very similar to planting my vegetables. I planted the seed of the yarn, sent my money to the till, picked the pattern plant and now all I need to do is water and fertilize it and next thing you know I'll have a scarf crop. Hopefully it will be just as yummy as the tomatoes. I wish you all a healthy crop of knitting this holiday weekend! Funny! I just posted about my Marjaana as well. you're not going to believe this but my counter is also overflowing with tomatoes from our garden. LOL! i am so glad you enjoyed this round with brooke. she is one of my girls i knit with. extremely fun! enjoy harlot! cant wait for pictures!